Katarina Radovic was born in 1976 in Belgrade, Serbia, where she currently lives and works. Saint-John Perse’s famous verse in Eloges XVII (Praises) “Quand vous aurez fini de me coiffer, j’aurai fini de vous haïr,” (When you’ve stopped combing me, I’ll stop hating you) could probably best describe what all black girls feel towards their mothers, older sisters or cousins during the several-hour long rituals of hair-styling, a dramatic event in the life of every African woman. This photographic project was realized during my artist-in-residence stay at the Centre for Art and Design – WAAW, in the old colonial town of Saint-Louis, Senegal, in the summer of 2013. The story took place at one of the most frequented hair salons in Saint-Louis – Marieme Soda Diop’s – an almost exclusively women’s world, the zone of intimacy and gossip, where with the use of the traditional accessories and techniques, the entire spectre of women’s hairstyles emerged: from the completely ordinary to the incredibly lavish, depending on the occasion. Each of these hairstyles demanded time and patience, but also, indubitably, a certain dose of agony and pain. Hair has always had a special significance in the majority of African cultures, especially as a medium of power and communication in traditional societies. My interest was not primarily focused on the end product – hairstyles. I tried to record the beauty in the creation and the beauty in the coiffeuring of these hairstyles – the interaction between satisfaction and pain in the process of creating hairstyles in this African culture, as well as the personal emotions invested in this ‘sacrifice’ for the higher good, i.e. as the initiation into society and identification with certain ethnic, cultural and age groups, as well as the symbolising of social and economic status, religion, etc. I had tried to decipher, first hand, how pride and glory have their price, and how the stories about the desires and ambitions, and the stories of the shudders of pain, intertwined with the stories about hair. Today I firmly believe that there is something in the relationship between hairdressers and their customers which comes before the final product: the mixed feelings of tenderness, pain, obsession, seduction, trust, rivalry, love and hate; and that this ritual, to a certain extent, represents the model of the “sado-masochistic” relationship. 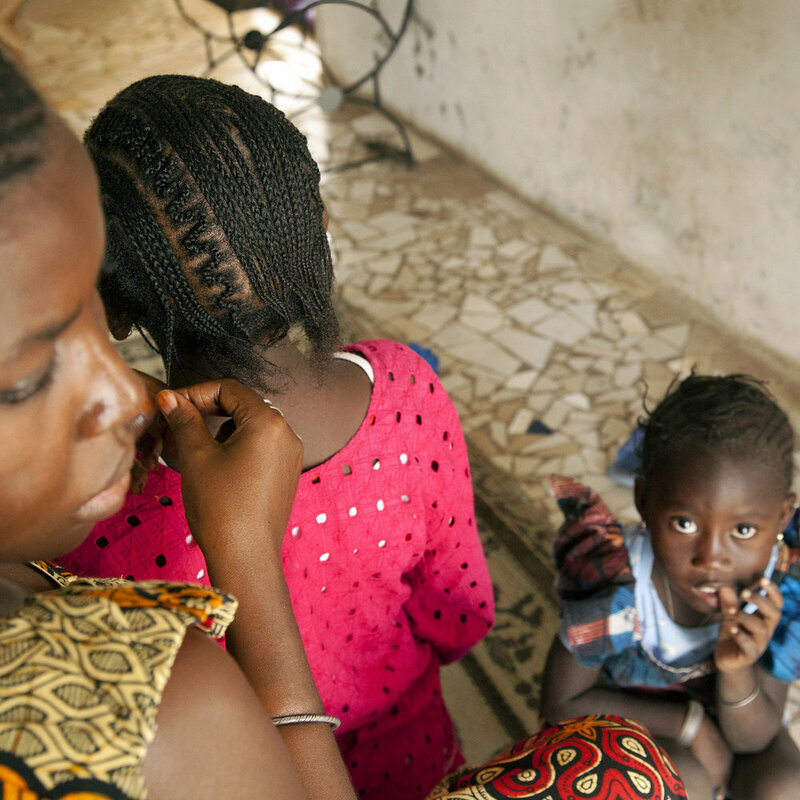 In Senegal, beauty is an important subject of debate. I wished to document the states, which point to the “before” and “after” moments in this process of dressing-up; which evoke the feeling that there is a goal in the process of the transformation of the hair, and with that the entire head, into a special art form and cultural entity, with all the symbolic implications: the desire to be liked and admired. It is the observer who should imagine for which occasion each and every one of these women is preparing, and what each of them is feeling. 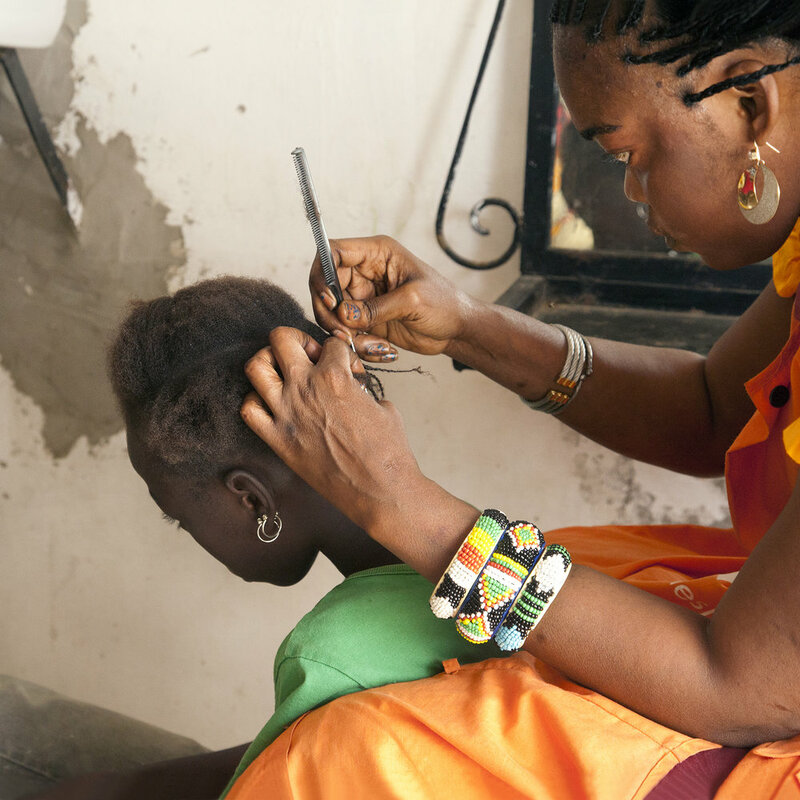 Perhaps what charmed me most was that, in this little hairdresser’s salon in Senegal, the desire for beauty and the need to be liked and admired proved far stronger than the pain!